As soon as the temperature outside drops naturally we begin to crave more warming and comforting foods. But just because we might be approaching the winter months doesn’t mean we should disregard juicing! On the contrary, drinking a large glass of cold-pressed juice daily is an amazing healthy habit we should maintain all year round. Fresh juice daily is a powerful remedy that supplies your body with an abundance of vitamins, minerals and enzymes that are especially important to help fight off colds, flu and sinuses during the changing seasons. Today’s recipe features a hot, potent and tasty combination of fruits, veggies and herbs that are all cleansing, detoxifying and boosts the metabolism. The key ingredients in this juice also help reduce bloating and inflammation, relieve constipation and promote healthy gut flora. During the cooler months, we mostly rely on produce that is in season. Currently, we live in BC, Canada so we opt for things like carrots, celery, beets, kale, peppers, oranges and apples. Carrot Juice is beneficial for many reasons. For example, it promotes healthy digestion and assimilation of nutrients from the foods we consume. You might think about good digestion, in terms of having a good poop (yes, I said it!) – no constipation, no bloating, no gas and so on, but healthy digestion is more important than that. Healthy digestion is necessary for the proper absorption of nutrients in your food. So in short drinking carrot juice stimulates the secretion of digestive juices so that your body can benefit from all the macro and micronutrients you consume. Celery juice contains special nutrients that are known to promote optimal functioning of the digestive tract. These potent nutrients act as a natural laxative and relax the nerves that have been damaged by an unhealthy lifestyle and poor food choices. Celery juice also contains a healthy amount of sodium that assists the body with the elimination process of toxins from every inch of your body, including your gut, helping to heal and regenerate your stomach lining. Apple juice is wonderful for flushing out existing toxins and can effectively treat constipation cramping, bloating, and diarrhea. One of the lesser known substances in apples is called malic acid, which can improve the digestive rate and support liver function. It also contains sorbitol which helps in smoothening the digestive tract, by extracting water from the large intestine and pushing it into the colon, thereby easing the movement of stool. Ginger is one of the best foods to consume for the healing of digestive disorders, or just simply to strengthen your digestive system. It also helps remove harmful bacteria from your gut that might compromise your immune system. On top of that ginger kicks the metabolism into gear by causing the stomach to produce more acid. This can stimulate the appetite for those looking to gain weight, or for those suffering from health issues that cause a decrease in appetite. However, it can also be beneficial for people looking to lose weight, as the extra acid in the stomach turns on the metabolism, causing your body to burn more calories and fat. It’s a wonderful choice for a pre-workout boost! Turmeric is one of nature’s most powerful anti-inflammatories. Curcumin, the potent substance within turmeric, helps stimulate the gallbladder to produce bile. Turmeric is known to combat indigestion, bloating and gas. Fresh turmeric root is not always easy to get, however you can simply replace it with ground turmeric instead. Quick tip: Add a little bit of black pepper to your turmeric juice recipes. This will help the curcumin in the turmeric be more available. 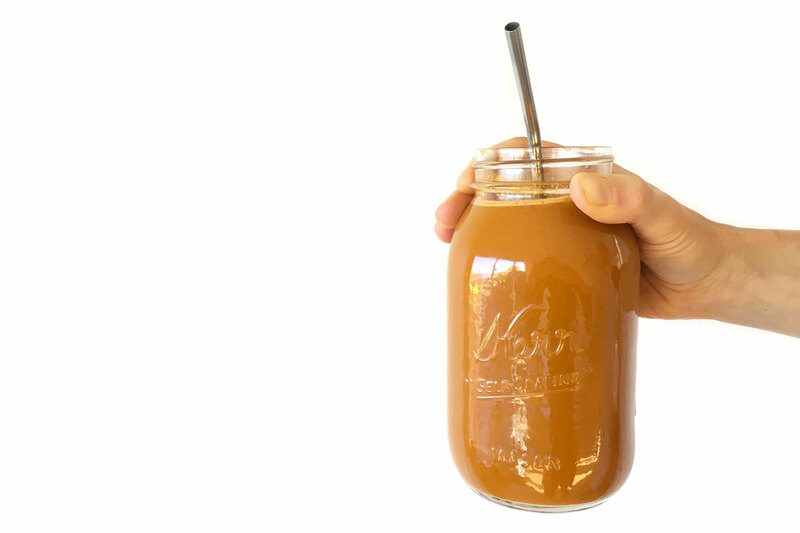 Cayenne pepper might sound like a crazy choice for juice, but hear us out. A cayenne shot can do wonders for your digestive system. First off, cayenne pepper stimulates the salivary glands, helping produce saliva. Saliva production is the initial step in digestion; it’s what kicks off the whole process. Beyond supporting the digestive system, it’s also one of the best sources of vitamin C! Coconut water is the juice (water) from a young coconut. In its natural form, it is antibacterial and antimicrobial. It can help balance the ratio of good-to-bad bacteria in your digestive tract. Coconut water is also said to be a cure-all for a range of digestive ailments and has been used in the tropics to treat stomach flu, indigestion, constipation and intestinal worms. Quick tip: If possible opt for a fresh young coconut, crack it open and drain the juice. Otherwise look for an organic coconut water with no additives. Winter Juice For Digestion and Healthy Gut! This sweet & spicy juice a potent combination of fruits, veggies and herbs that are all cleansing, detoxifying and boosts the metabolism. The key ingredients in this juice also help reduce bloating and inflammation, relieve constipation and promote healthy gut flora. Put the juice into a large glass jar add in coconut water and black pepper. If you are looking for health-promoting juice recipes look at this Juice For Weight Loss, Energy and Detox or Cellulite Removing & Fat Burning Juice. Nd I stumbled across this site when looking for new recipes. And I couldn’t be any happier not only are they a ton of recipes but the information given about each ingredient is a added bonus!